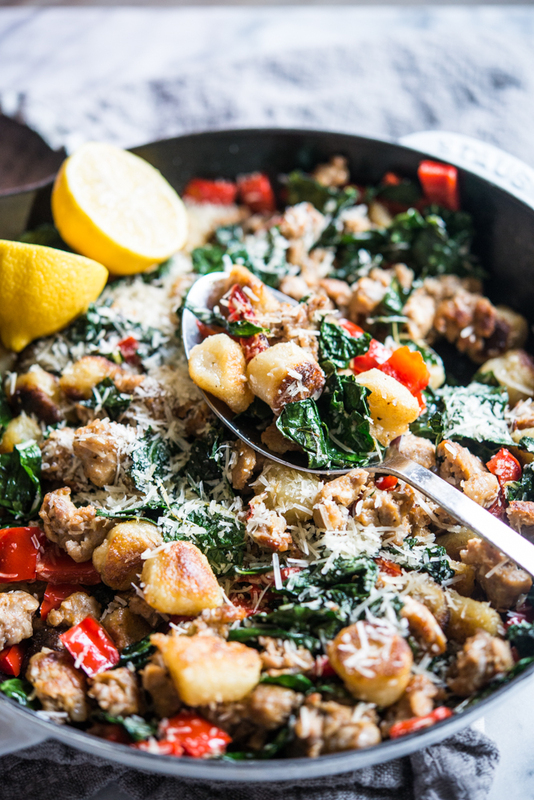 This cauliflower gnocchi and sausage skillet is the perfect weeknight meal! 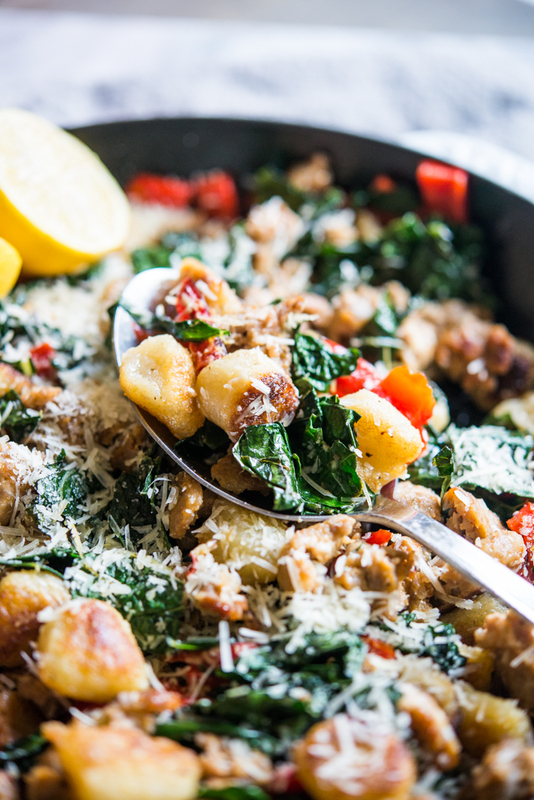 It is packed with red bell peppers, kale, Italian sausage, and crispy gnocchi for an easy and flavorful dinner. It took a little while, but we finally tried the much-hyped Trader Joe's cauliflower gnocchi and we were impressed! 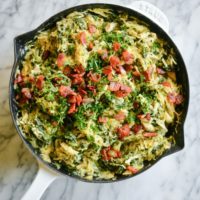 This really is a great healthier convenience food that will help add some variety to your weeknight dinner routine. Our first order of business after trying it was to create this one pan cauliflower gnocchi and sausage skillet for an easy 30 minute meal. It has crispy Italian sausage, sweet red bell peppers, and our classic lemony kale, and we topped it off with a little freshly shredded parmesan. Defrost it! The package advises that you cook the gnocchi straight from frozen, but we found that defrosting first was the way to go, because the excess water from frozen gnocchi makes it stick to the pan and causes a soggy texture. You can either leave the gnocchi at room temperature for an hour or two, or microwave it in 30 second intervals until fully defrosted. Then, you'll want to thoroughly pat it dry – remember, excess moisture is the enemy here! Use your best non-stick pan. We found this to be key to getting the crispiest gnocchi. We first tried with a cast iron skillet, but found that the gnocchi was sticking, so we used this non-stick pan instead and it worked like a charm! Add enough fat to the pan. This isn't the time to be stingy with your oil. Fat serves two purposes here – first, it helps prevent the gnocchi from sticking, and second, it ensures perfectly browned, crispy gnocchi. 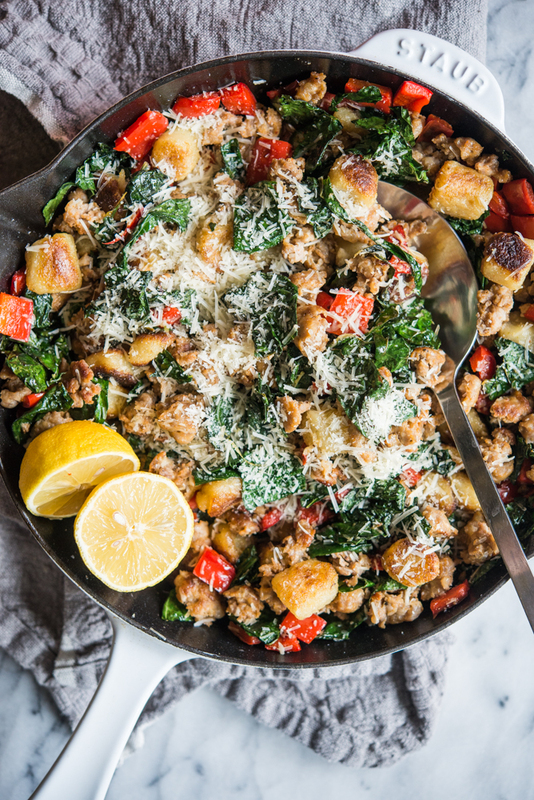 To finish this cauliflower gnocchi and sausage skillet, you'll simply cook up the sausage, saute the peppers, wilt the kale, then toss it all with a bit of lemon juice and parmesan. If you want to speed up the cooking process, you can easily cook the gnocchi in one skillet while the sausage is cooking in a separate skillet, but we wanted to go the as-few-dishes-as-possible route! We hope you love this dish! This one pan gnocchi sausage skillet is the easiest meal to get on the table, all in under 30 minutes! Defrost the gnocchi: you can either leave the gnocchi out at room temperature for about two hours, or microwave in 30 second intervals until fully defrosted. Pat the gnocchi dry. Add one tablespoon olive oil to a non-stick skillet over medium heat. Once hot, add the defrosted gnocchi. Let cook for 2-3 minutes, until browned, then flip and cook an additional 1-2 minutes, until browned. Remove the gnocchi from the pan, then add the sausage to the pan. Cook for 6-8 minutes, until crisp, then remove from the pan and drain off the excess fat. Add the remaining tablespoon olive oil to the pan along with the bell pepper and garlic and cook for 3-4 minutes, until the bell pepper is wilted, then add the shredded kale. Cover the pan to steam the kale for 3-4 minutes, until wilted, then stir in the lemon juice and salt. Add the sausage and gnocchi back to the pan, then sprinkle with shredded parmesan cheese and serve! If you'd prefer to use a different kind of gnocchi, just follow the cooking instructions on the package and proceed with step 1. A good non-stick skillet is essential for getting the gnocchi crisp! If the gnocchi starts to stick, just gently loosen it from the pan and let it continue to crisp. I don’t eat meat, can you think of something to replace the sausage and still enjoy a nice taste. I love your recipes…they bring a lot of joy to our family. I ordered your book and am so excited. Is there onion in this recipe? Step 4 is a bit confusing when it states “cook… until the onion is translucent and bell pepper is wilted.” I had to double check the recipe, just wanted to verify. Hi Lane! We just edited that part, and it should read correctly! There is no onion in this version, but it would be a lovely add in if you’d like! Hi! In step 4 you mention to sauté until onion is translucent but you do not mention onion in the Ingredients. Can you clarify? Hi Jess! That step has been taken out, although onion would be a great add in if you’d like to toss it in! 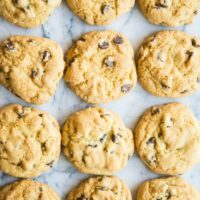 Delicious and super easy! Some of the comments mentioned the onion, I added about half of one because I thought hey that would actually be yum whether it was supposed to be in or not, and it worked great! Hi Silvia! So glad you liked it! 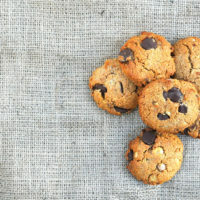 Just updated the recipe, and while the original version doesn’t have onion, I’m glad to hear it tasted DELICOUS with! This was delicious!! All of our kiddos approved, which is high praise 😉 The only adaptation I made was subbing a pinch of red pepper flakes for the jalapeno, as I didn’t have one. Definitely making this again!